Drive project focuses on the forces and choices that arbitrarily alter our individual and shared sense of purpose, exploring the concept of a city as a place of compulsive movement. This video project involves footage captured while driving within city traffic at dusk, filming various drifting and chance occurrences. 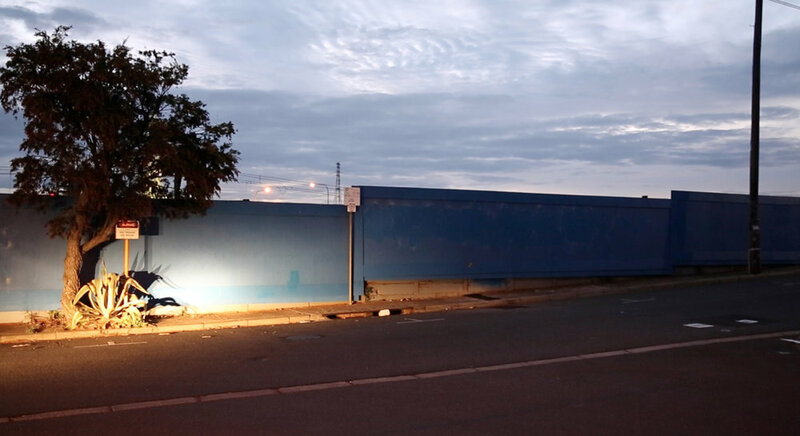 IMAGES | Peter Westwood, Long blue wall, 2013, video stil| Images courtesy of the artist. This video project focuses on the forces and choices that arbitrarily alter our individual sense of purpose by exploring the subject of city as a place of compulsive movement and formless stasis, experienced through random and variable encounters. Through footage captured while driving home over countless days within the city traffic at dusk, this work forms through the presentation of chance occurrences in order to evoke what we all experience when we drive through the city: the recognition of moving towards a destination in our thinking while equally drifting within our minds, imagining narratives and mutable and divergent possibilities. The city as phenomena has often been presented as a space of alienation, or conversely utopianism, and has been the subject of art since the 19th Century. Drive investigates the city as an inconclusive space, as a location so familiar and habitual to those incessantly moving within their own urban space that we may often experience narratives formed through a type of disembodied interiority. By stepping out of our conscious sense of predetermination and by drifting within our minds while driving, our experience and sense of being may feel more subject to forces or choices that arbitrarily alter our sense of purpose, particularly as journeys by definition usually must go somewhere. Therefore in driving and drifting, and experiencing fragmentary encounters, the expectation of arrival is constantly frustrated or absent in this work, leaving us instead with perpetual movement and stasis, along with the uncomfortable suggestion that these two states may in fact be the same thing within an indeterminate and seemingly endless urban zone. The failure of arrival, the lack of a clear narrative focus within this work may in turn necessitate within us a reassessment and re-adjustment of our expectations, perhaps evoking a perpetual and ongoing state of potential and inertia. This work asks that you visit city passages in unfamiliar ways to reflect on experiences formed through various chance occurrences, to connect to the idea that transit is both an embodied and disembodied encounter where we suffer a state of perpetual commencement and stillness. Acknowledgement: Peter Westwood is represented by Block Projects in Melbourne and Boutwell Draper Gallery in Sydney.